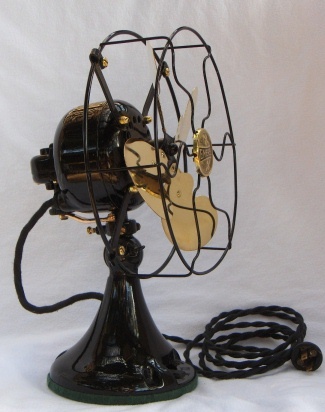 "EMERSON FANS BUILT TO LAST"
Oscillating 3 Speed (runs correctly on all speeds). 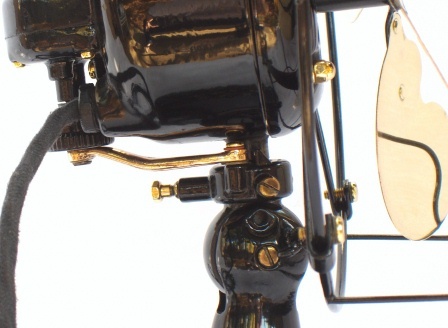 9" Brass Blades and brass hardware have been highly polished on a buffing wheel. Motor windings have been resealed and received NOS style (new old stock) cloth covered wiring that has been solder connected. New line cord is NOS style cloth covered wiring and has a new early style reproduction plug. Base dimension is 6" across, and has new felt on the bottom to protect your furniture. All of the machine screws have been replaced with brass or have been polished. Smaller size makes it convenient to move from room to room. Perfect for a small room, kitchen or bedroom. Ready for another 90 years of service! 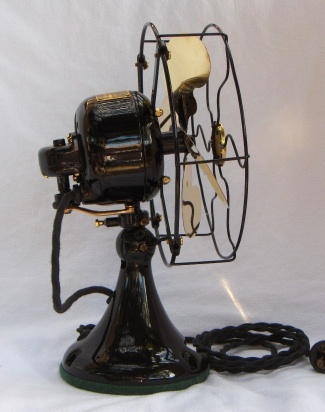 Emerson made many of these fans in their 12" and 16" models, but the 10" models such as this one were not produced in abundance and have become increasingly harder to find. Herbert L. Parker became the president of Emerson Electric and Manufacturing Company in 1892. He patented his new "Scalloped Parker Blade" on Set. 12, 1899. There is a stamped insignia on one of the blades to this effect. 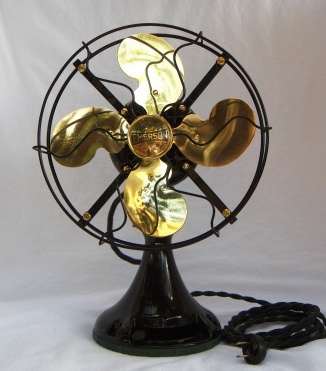 This 3 speed oscillating fan has a single bearing motor, which became a hallmark of Emerson fans. 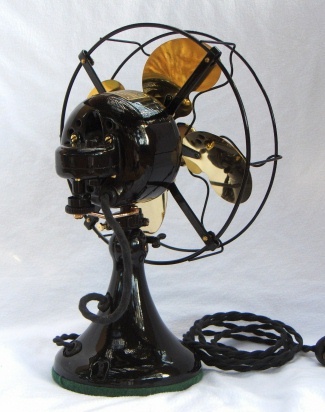 Emerson guaranteed that after lubricating your fan, excess oil would never run out of the bearing, onto the spinning blades and spraying the room with oil. Before then, all fans of this period would commonly spray oil after being lubricated, hence damaging furnishings and clothing. This was a revolutionary claim which brought about many devoted customers of the pre-air conditioning era.